Like a rich uncle, Hugo attends a Cuban graduation this weekend. 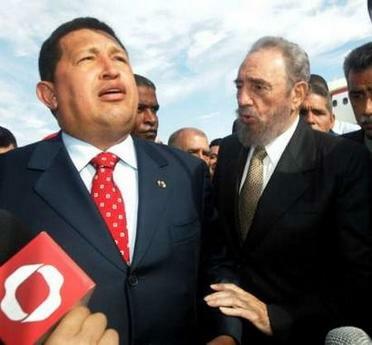 The leftist-populist Chavez will make his 13th visit to Cuba since taking power in 1999 to visit his personal friend, Castro. At the Latin American School of Medicine, Chavez will attend a graduation of students from several countries, including 400 Venezuelans. Chavez, who hosts a weekly radio call-in program, “Hello, Mr. President,” will this weekend take questions alongside Castro in Havana. The famously long-winded Castro launched a similar program in March, in which he chats for hours before a television audience on policies, both domestic and foreign. “I don’t know how many hours ‘Hello, Mr. President’ is going to last,” Chavez joked. One member said she saw a completely different lifestyle than the one she knows here in the U.S., saying one is just as likely to see oxen plowing a field as a tractor or an entire family on one bicycle rather than one person in a car. Aufderheide said one of the most amazing parts of the trip was getting a chance to hear Fidel Castro, Cuba’s president, speak. “He was totally wonderful,” she said, noting that he spoke for more than four hours. She said he talked about various ways to stimulate the Cuban economy. One idea was to go into the bon bon business, because of Cuba’s access to cocoa. She said she was impressed by Cubans’ ability to treat Americans with respect after all that U.S. policy has done to their country over the years. There is no word if the Pastors for Peace were allowed electricity during their stay.